Is Your Advertising Suffering from Poor Performance? Marketers have seen a wide range of traditional advertising become less and less effective in recent years. Some of the reasons for the poor ad performance are obvious, while others require a little more exploration. Newspapers – Circulation and readership are down so there’s just not enough people seeing your advertisement. Billboards – The days of relying on consumers to read your billboards as they drive by are gone. Typically, passengers were counted as likely consumers of the message. Most drivers and passengers are talking or focused on their phones or tablets with limited focus on anything outside of their direct line of site, including billboards. TV / Radio – Digital recording and on-demand TV has enabled consumers to skip advertising. To make matters worse, entire market segments are consuming shows and content through services like Netflix, Hulu, Satellite Radio, and Spotify, that eliminate the potential for effective local advertising altogether. What about email and digital advertising? Email – What started out as a potentially dominant marketing tool has been diluted due to a heavy volume of spam and junk emails. Email has been further diminished by the transition to mobile devices with as many as 75% of the market reading most of their email on smartphones or tablets. The high-impact nature of reading on a desktop monitor is now gone and the subject line needs to be compelling or it will likely be skipped over in the millisecond evaluation made by mobile users. Social Media – While social media will continue to evolve, it is seen by many as potentially hitting a break point where consumers are feeling overwhelmed by the social pressure to participate in sometimes dozens of platforms. From leaders like Facebook, Twitter and Instagram to newcomers like Snapchat and Yik Yak, consumers are spending so much time keeping up with the latest trends and generating content that marketers need to question where the real commerce is taking place. Digital / Online– Search engine marketing and optimization are critical components to any marketing strategy and in most cases provide a reasonably strong ROI. However, this marketing component is heavily reliant on the consumer making a buying decision and actively searching for solutions to make a price comparison. The “in market” consumers are only a small part of the potential market, typically 3% at any given time. As marketers, we need to rely on strategies that pull more prospects into the market BEFORE they choose to enter on their own. Promotional efforts will often limit the extent of competition evaluated at the same time and will greatly increase the number of prospects. It’s great if online efforts generate 50 leads per month at a low cost per lead, however, if a business needs 300-400 prospects to meet its objectives, expanding beyond online efforts aimed primarily at those currently in the market is important. What traditional marketing approach continues to have good ad performance? Marketing-related direct mail continues to be uninterrupted in its ability to deliver a targeted message to consumers that, at minimum, are forced to evaluate the message and as marketers, that’s the only opportunity we’re looking for. However, people are doing more than just evaluating the messages found in direct mail. In fact, as of 2017, household direct mail response rates for prospects were as much as 3.7%, which is more than email, social media and online advertising combined. When combined with direct mail, web banner ads and IP address targeting can lift your campaign to achieve even greater results! 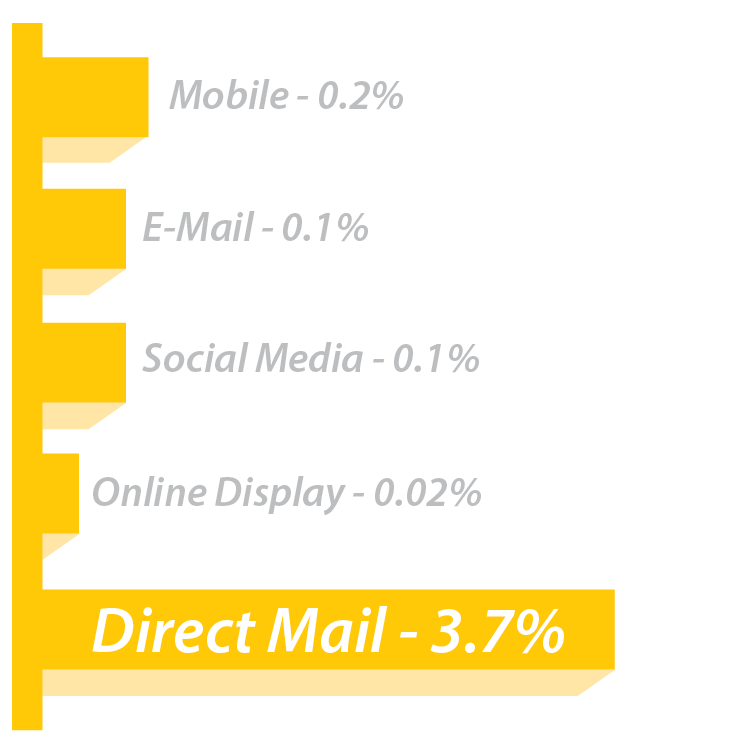 What kind of direct mail performs the best? In our experience, we’ve found that oversized direct mail pieces, such as the monster mailer, are 15% more likely to be noticed by a prospect who hasn’t done business with you yet. At 8.5″ x 14″, this piece still fits into both urban and rural mailboxes and turns your message from a 3 second reader into a 30 second reader. These mailers see a higher response rate because of their increased real estate for a bigger and bolder design for your offers.